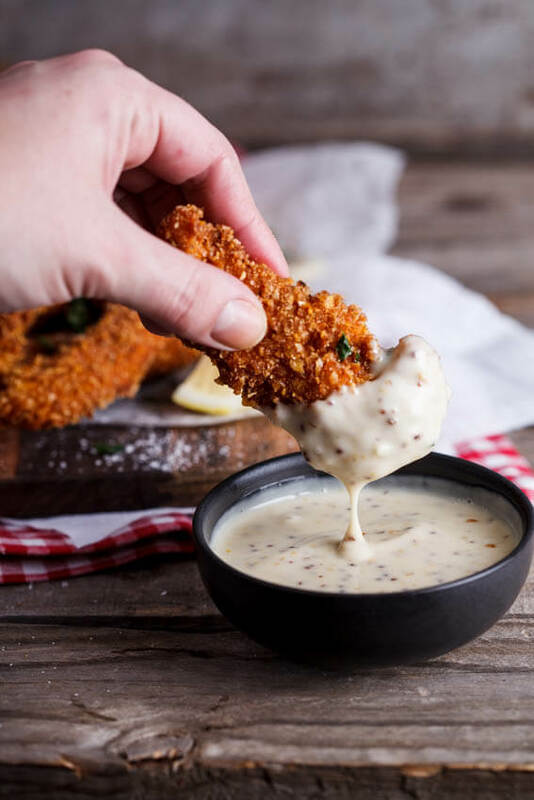 Crispy corn flake crusted chicken strips served with an easy honey-mustard dipping sauce is the perfect easy game day snack or casual appetizer. A while ago the kids asked me what my favorite food was as a kid. I told them that I used to absolutely love fast food chicken nuggets with the honey-mustard sauce that came with it and they immediately demanded I make them my version. And so I did. And you guys. It was SO good. And SO much better than what I ever remember eating as a child. I decided to use my trusty corn flake-crusting method I used on my Chicken Parm recipe and made chicken strips (or chicken tenders, depending on where you live) instead of nuggets. But let’s get real, the sauce is what makes this. It could also not be easier. I used a good quality shop-bought mayo, Dijon mustard as well as wholegrain mustard for that lovely warmth, honey and a good squeeze of lemon juice to add the right amount of zing. I’m not even lying to you, I could eat this just as is. It was completely addictive. But add crispy, crunchy, succulent chicken and you have a total masterpiece on your hands. 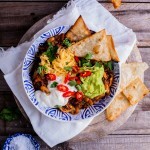 This is, to me, the ultimate easy, casual snack/lunch/dinner and can you just imagine how great it would be on game day? Yes!! 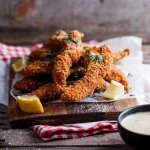 How do I make crispy chicken tenders? 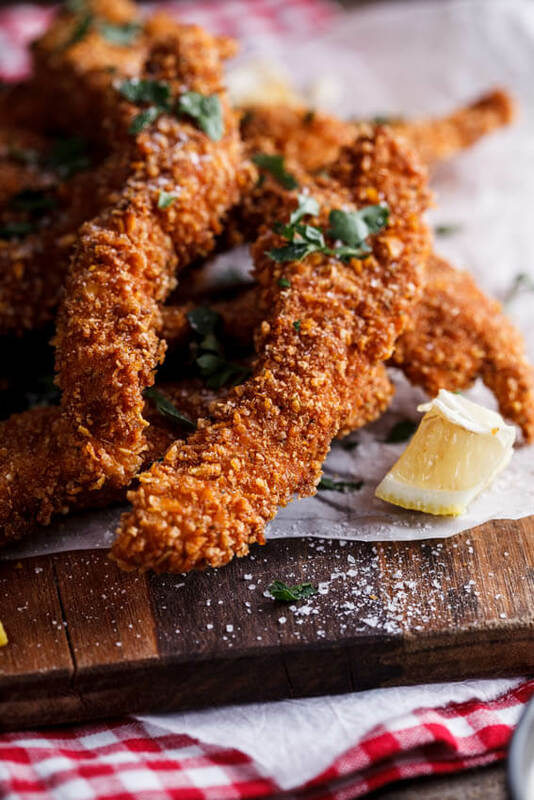 Using crushed corn flakes is a great way to add a lot of crunch to chicken tenders/strips. Because the corn flakes are already so crunchy, they become even more so when fried and make an excellent coating for chicken. Coat chicken strips first in seasoned flour then in beaten egg and finally in crushed corn flakes. Fry in hot oil until golden brown and cooked through then drain and serve with honey-mustard sauce. 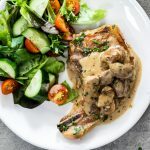 How do you make honey mustard sauce? Combine mayonnaise, Dijon and wholegrain mustard, lemon juice, honey and salt in a bowl and mix well. Using good quality mayonnaise (home-made or Hellmann’s is my preference) and mustard is key to creating a delicious dipping sauce. What sides to eat with chicken tenders? 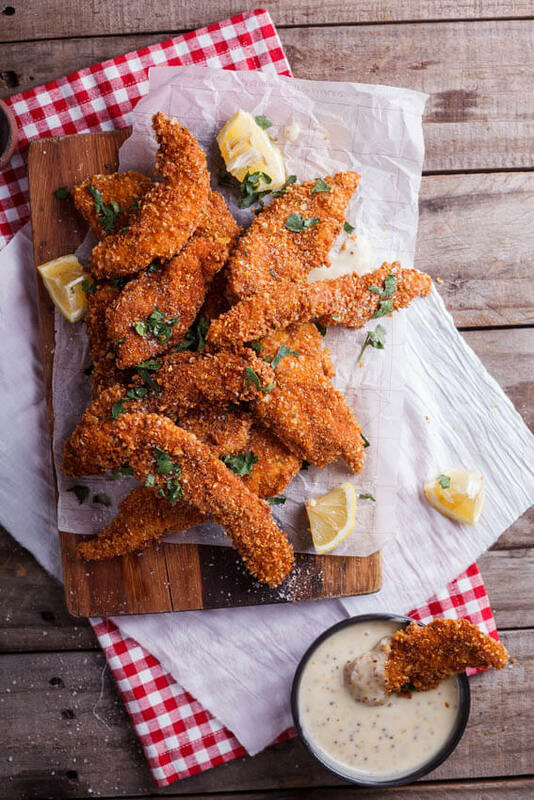 To make the chicken strips, place the seasoned flour, egg and corn flake crumbs in separate bowls. Add the paprika, oregano, salt and pepper to the corn flake crumbs and mix well. Coat the chicken strips first in the flour, then in egg and then in the corn flake crumbs. For an extra thick coating, you could repeat the egg and corn flake steps but you might need more of both egg and corn flakes. When all the chicken is coated, heat enough oil to fry them in a deep frying pan/skillet. Fry the chicken until golden brown on both sides and cooked through. Remove from the oil and allow to drain on a piece of kitchen paper. To make the honey mustard dipping sauce, combine all the ingredients and mix well. 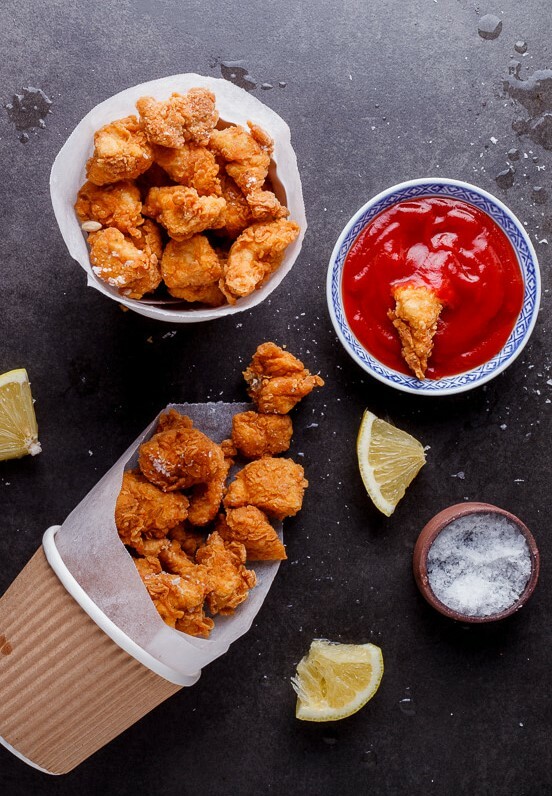 Serve the hot chicken strips with the honey-mustard dipping sauce. Looking So Awesome and Yummy Recipe. Thank you so much for sharing this lovely recipe. 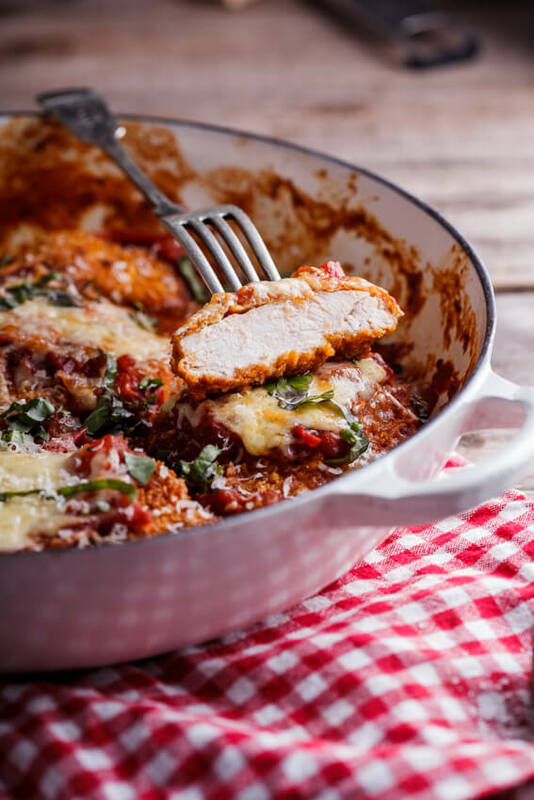 The boys are home from boarding school and I think this will be the perfect Friday supper for them tonight quick and simple have just printed it off can’t wait. I am sure this is going to beat my crusted chicken strips recipe love the addition of the paprika and oregano. I just throw aromat into my breadcrumbs for flavour and have never used cornflakes so here goes!! Yum! I hope they loved them! I’m really inspired to make for my family. Thank you for sharing the corn flake crusted chicken strips and I’m also loved it. Have to save this to try soon! I am a fan of fried chicken! And of course, I seem to love your honey mustard sauce! Thanks & Merry Christmas! Thanks so much Emily! Merry Christmas! i try to do it yesterday and something was wrong with the sauce. May be i’ll try another day. Thanks for your recipe! Hi Sabrina. I’m so sorry about that, what went wrong? These look so much better than fast food Alida! I love the crunchy crust and I love the dipping sauce. My son Casey would be drooling over these! Thanks Mary Ann! That dippin sauce is everything! Hahaha I too used to love “that place” but your chicken looks way better than theirs ever did. Those chicken strips looks so good. Great meal for kids too. I am obsessed with honey-mustard anything so this is right up my street. Thanks for sharing! You will love these then Jenni!